It is necessary to make some preparations so that the move can be completed without any problems. If the SQL server and the application server are on the same machine, the SQL server should be installed on the new machine first. It is necessary to observe the system requirements for this process. The Password Safe server is installed next (see System requirements). The installation itself is described under “Installation of the AdminClient. After the server has been installed, the basic configuration is completed. A new configuration database will be created on the SQL server as a result. If you want to retain the old SQL server, it is necessary to give the configuration database a new name. The licence first needs to be deactivated before it can be activated on the new server (see options under “License settings). Now stop the server so that nothing more can be changed in the database. After making these preparations, the data from the old server can be backed up. If using a virtual machine, a backup of it should be created. The old version of the server can then be restored in the event of problems. In order to transfer the data to the new server, a backup of the database should be created. Although this is also possible via the AdminClient, we recommend carrying out the backup at the SQL level: right click on the database, then on Tasks and Backup. The desired target folder is selected in the following window. It is essential that the all available certificates are backed up. Depending on the installation, a different number of certificates are required here. After the backed up data (database and certificate) has been transferred to the new server, it still needs to be integrated. Firstly, a new database is created on the SQL server. 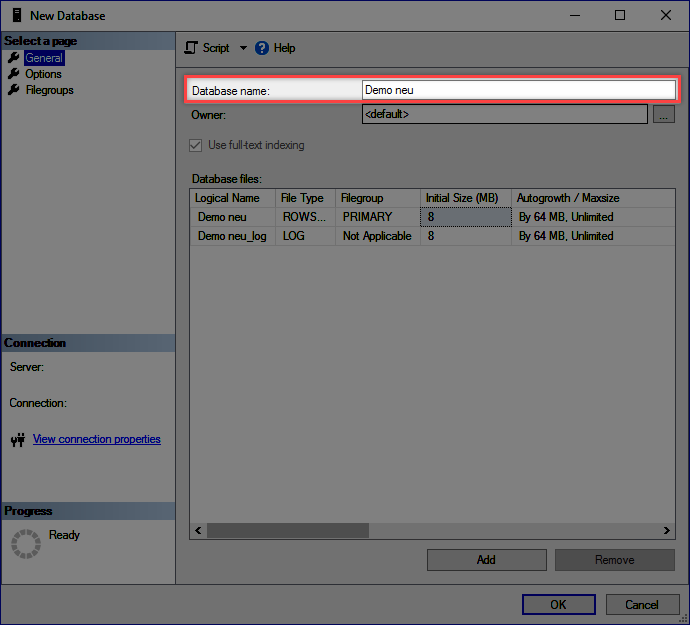 This option can be found in the SQL Management Studio after right clicking on Databases. It is usually sufficient to simply enter the database names. As soon as the database has been created, the option Restore (under Tasks) can be selected by right clicking on the server. The Database is thus selected here. The backup now needs to be selected. It is also essential to check whether the correct database has been selected in the field “Target”. 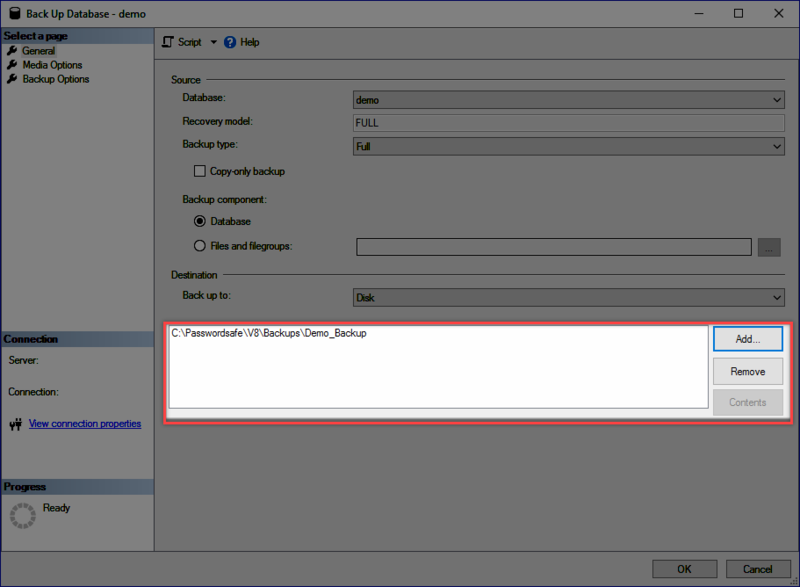 *This method can be also used to import backups that were directly created from the AdminClient. 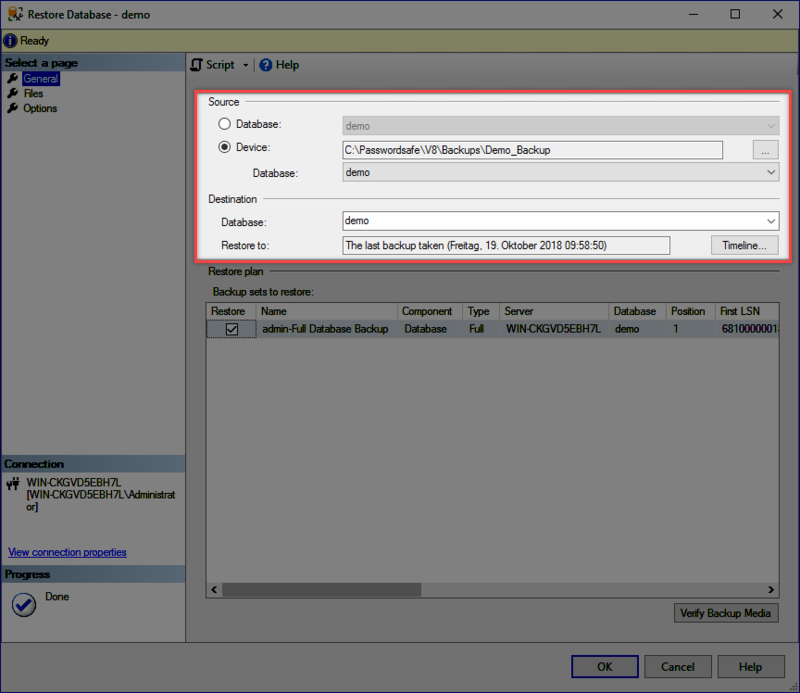 After the backup has been installed on the new database, you can be start the AdminClient and run the setup wizard. The setup wizard is used for (amongst other things) reactivating the licence. It is now possible to enter all of the desired configurations for the server. The backed up certificates are imported via the certificate manager. Finally, the database is integrated onto the server via the database wizard. If the IP and/or host name for the server has changed, it is necessary to create/roll out new database profiles from the client.